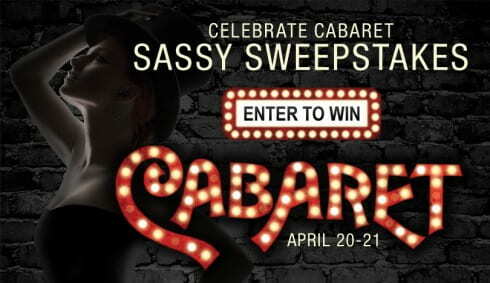 Celebrate the opening of Cabaret by entering the Cabaret Sweepstakes on Facebook. Participants could win free MP3 downloads, an entire MP3 album, and two tickets to Cabaret on Friday, April 20, along with a Cabaret backstage pass. The grand prize includes dinner for four along with four tickets to see the show on Saturday, April 21. In order to legally comply with Facebook policy, a promotion must be conducted via a third party application. In the case of the Cabaret Sweepstakes, we chose to use woobox.com. In order to participate in the promotion, the Sweepstakes app will prompt participants for access to profile information including name, profile picture, gender, networks, user ID, list of friends, and any other information that you have made public on your profile. This entry was posted in News, University News and tagged Events, music, theatre, weidner center on March 14, 2012 by bassettb. Care to go ‘backstage’ for Cabaret? Discover Cabaret from page to stage as Director Laura Riddle presents a behind-the-scenes look at the production of this award-winning musical, in the Fort Howard Hall theater at the Weidner Center immediately following the 7:30 p.m. show on Friday, April 20. Reserve your space now. Passes cost $20 and may only be purchased in advance from the University Ticketing Service & Information Center, 920‑465‑2400. You may purchase your Cabaret tickets at the same time. 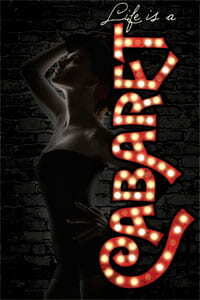 Reserved seating advance purchase for Cabaret — Adult: $30, $25; Under 18, Senior: $27, $22. This entry was posted in News, University News and tagged music, theatre, weidner center on March 14, 2012 by bassettb. Register today for the newly revived Dinner Lecture Series on Thursday, March 29, sponsored by UW-Green Bay Outreach and Adult Access. Prof. Meir Russ will present “Israel: The High-Tech Wonder in the Desert” in the Phoenix Room of the University Union. Enjoy an evening of international education and delicious Israeli cuisine. Cost is $24. Click for more information or to register: www.uwgb.edu/outreach/israel. This entry was posted in News, University News and tagged dinner lecture series, Events, Outreach and Adult Access on March 14, 2012 by bassettb. Since Oct. 1, 2011 more than $40,000 in matching dollars has been donated to the University either by first-time donors, or increased gifts. Thanks Rick and Jim and everyone who has contributed so far! But there is still time to DOUBLE YOUR IMPACT. 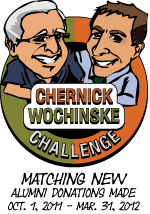 The Challenge ends March 31, 2012, so now is the perfect time to make a gift that helps students at UW-Green Bay! This entry was posted in News, University News and tagged Chernick/Wochinske Challenge, gifts on March 14, 2012 by bassettb. Youth and adults will enjoy the best this campus has to offer including high quality instruction from UW-Green Bay faculty, state-of-the-art facilities, and a perfect location for a summer learning experience offered through the Division of Outreach and Adult Access. For more on all of the camps and to register online: www.uwgb.edu/camps/. This entry was posted in News, University News and tagged community, Events, Outreach and Adult Access, summer camps on March 14, 2012 by bassettb.